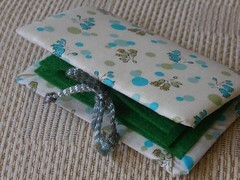 Needle case is 4″ x 2.5″, Liberty print cover and green felt interior. Plus postage – 60p to Europe, £1.05 to USA/Canada, £1.12 to Asia/Australia. I accept UK sterling cheques or Paypal. Enjoy!